Later topic: Any Austin classes or workshops? Hello! My name is Kim and I live in Central Florida. This is my first post here. Yesterday I bought a Craftsmen letterpress from a book dealer at an antique mall. He said he had it for many years just sitting on display in his living room and recently decided to sell it…hooray for me(I hope)! He said it is a 5x8 but I’m not sure. I know it is missing a roller and I’ve been trying to find pictures online of the same model but I cannot find any that look like mine. I’d like to be able to compare photos and see what other parts it’s missing. I was hoping if I posted pictures here some of you might be able to tell me more about the press. Craftsman presses are good machines. Looks like you need new rollers. If you know model of press you may still be able to get some parts from the manufacturer in Mass. Email me and I will try to send you there name and address. I carry all types of letterpress supplies. List available. Congratulations on your new press! If you want to double check the press size, you should measure the inside of the chase. It also looks like you’re missing the gripper bars (which are used to hold the paper to the platen when the press pulls away from the printing form). I did a quick search and found a couple pictures of Craftsman Imperial 5x8s, which seem similar to your press. The roller set-up is different however. But you can see the gripper bars on those presses sticking out between the bed and the platen. Anyway, here are some links (http://lasvegas.craigslist.org/clt/1135884453.html and http://www.flickr.com/photos/neeq/2763282925/). Looks like you have a Craftsmen No. C1 Victory press. The inside dimensions of the chase should be 6 3/8 x 4 1/2. I’ve not seen any of these in the searching I’ve done on the net. 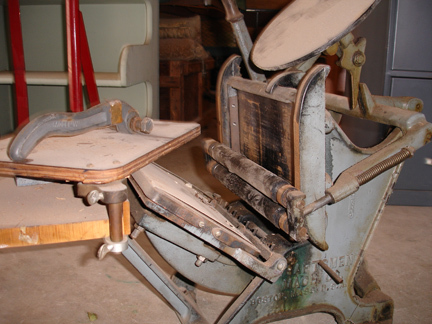 I do have a catalog on Flickr that lists the press for $75 in the early days of Craftsmen Machinery. Here is the website for Craftsmen. They may be a great resource for getting the parts that you need. I have recently restored a Craftsmen Imperial 5x8. Not the same as yours but it could be helpful for reference for you. If you are interested in some pics, just let me know. I have a similar press that’s a 4-1/2x6-1/4 (inside chase) but it’s different in several ways. Mine has a bracket for a feed table which appears not to have been a feature of yours — there is no place to attach it I can see. Your roller wheels/trucks are more like the Golding system with the bearing on the truck. Since you are missing two for a second roller you’ll need to get them from Craftsman if possible or have them made. The gripper bar on my press is square — I can’t see the bar on your press. Grippers for the square bar are much more difficult to make than for a round bar. My press is all apart in preparation for transport overseas so I can’t furnish photos — sorry! I’d say that your press is an early model, because it says Boston instead of Canada. Craftsmen copied their design from other manufacturers, even changing when the original manufacturer updated to new designs. Later designs probably included the bracket for the feed table that Adlib mentioned. The same bracket can be seen in the literature I have. The grippers can be manufactured by any competent machine or welding shop. Mine are just cold rolled steel welded to square tubing with a nut welded for a set screw on the gripper bar. If you’d like a photo of mine, I’d be glad to help. I did notice that your press is in the photo museum here on Briar Press. I found it on the next to last page of lever presses. Thank you so much for all of your input. I will definitely contact Craftsmen about parts. And now that I look at the picture of the “Victory” in the museum photos, I see that my press looks exactly like it. So it’s not an Imperial after all, but a Victory. The chase does measure 6 3/4 x 4 1/2. It was really exciting discovering what my press is. I can’t wait to start restoring it and collecting everything I will need to start printing! Be on the lookout for some amazing deals. The Lab Press will begin selling equipment and type this summer at great savings. The press pictured here found a great home thanks to a Briar Press posting. Congrats on a great machine! I have a Craftsman table top complete with a feed table, the inside chase measurements are 6 5/6” x 10”. I have never seen this press listed anywhere and would like to know if anyone might know the year it was made, Also I would be interested in selling it.